I took my 3 1/2 year old son Cash on his first hog hunt last night with my friends Brad Helzer & Brian Morris. We hunted Brad’s family’s ranch where right at dark we spotted several hogs coming into a wheat field. I threw Cash on my back for the most adventurous “piggyback” (pun-intended) ride of his life. We were able to cut this boar off, unload Cash off my back at the last second for me to take and make a 15 yard heart shot on this boar. Cash was able to watch Daddy shoot and see the boar go down a few seconds later. He looked at me with amazement in his face I have never seen before and said “Thank You Daddy”! Absolutely, 100% the highlight of my hunting career! I could not wait to share it with you all, what an amazing Father’s Day present!! Have a great weekend and Happy Fathers Day to all of you. SWEET! He’ll never forget that epic hunt with dad! Nice work, excellent shot too! Thanks Tom! I will certainly never forget it! Start em young and teach them right! Way to go! Couldn’t get either of my daughters interested in hunting… maybe the new son in law. Congrats brother….you are blessed in many ways! Thank you Curt! Like wise! Very cool. Happy Father’s Day! Great little story! My son is 11 months old and I cannot wait to take him on these types of trips! Good memories. They are the BEST! I now understand why they were so important to my dad growing up. Thanks Cory! I remember my first trip with my dad as well. Congrats Jason and happy fathers day. I know when earlier this year my son Caden was by my side for my Oryx harvest was the highlight of my hunting career. Happy Fathers Day! I wonder if early subscribers to the blog can still get the first prices Chugach pants and jacket? Please email service@kuiu.com to get on the list. You should be OK, the shipment will be here next week. Its an awesome experience to share with your kids. Its a feeling like no other. Congratulations. I can’t wait to do it with my little boy again. That is a killer story, what a great experience. I can’t wait to take my son out hunting, and this being my first Father’s day I think back to the hunting memories I have with my Dad and can’t wait to make a few more memories with the three of us. Speaking of Father’s Day gifts, my wife and mother informed me lastnight that I have approval to proceed to “checkout” with my KUIU shopping cart. There’s been many hints (subtle and not so subtle) dropped since we attended the Open House in April and I think I finally wore them down. I’ve got the hunt of a lifetime coming up with Stone Mountain Safaris this fall (with my Dad of course) and am glad to know one more box of prepardness has been checked off. ps – love the name Cash, it was one of my votes for my son given that my parents always called me J.R. in reference to Johnny Cash. My favorite memories afield involve my parents. I have traveled and hunted North America relentlessly, and yet the most important hunts were with my mom and dad in the back pasture. I applaud you for getting you son involved early. I wish there were more states that allowed parental discretion to determine at what age a youngster was “field ready” to ethically take game. I had the pleasure of helping 2 young men from Wyoming take their first deer on our family farm in Texas last season. They cannot hunt yet in Wyoming. The smiles on their faces were priceless, and ageless. Bravo on taking your son along. He will cherish the memory as much as, or more than you will. I know, since I was lucky enough to have such a father myself. Happy Father’s day to you and all the other dads out there who take their sons and daughters afield with them. That is so awesome! Congrats on some fine barbeque and a hunt you and your son will never forget. Keep the pressure on them and shoot’em close. Absolutely amazing Jason! Without being able of passing our passion would not be the same! Thanks for sharing! Would have love to see you running with your son on the backpack!!! Haha sweet! No better gift could a Father ask for. What a great story!!. I myself have had the privilege of being accompanied by my son on many of my own hunts and then watch him harvest his first deer and spring turkey this past year. 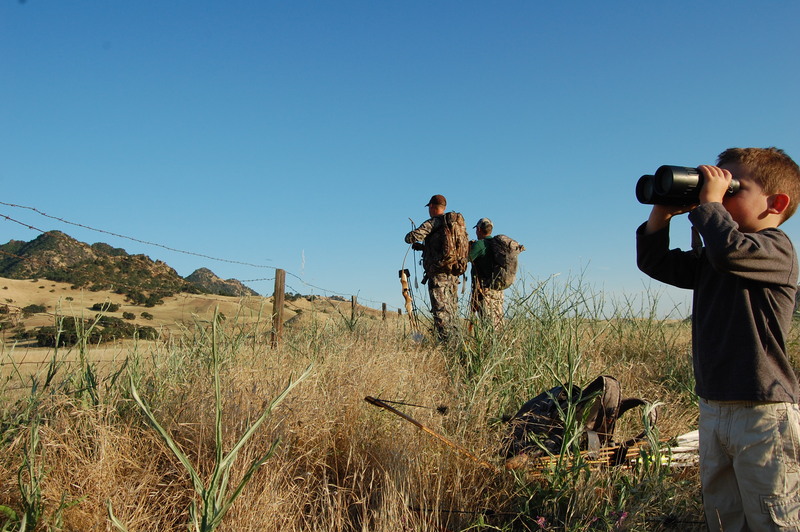 There is no greater feeling than being able to spend that quality time in the field with a son or a daughter. May God bless you, your family and all of our other fellow hunting Dads this upcoming fathers day. That’s awesome!! He’ll never forget that. And neither will you. Great photos. Happy Father’s Day! LOL! Larry you were not supposed to say anything! Jason, Thanks for sharing! our children are the only thing we leave behind when we pass away, you planted the seed. Congrats on the HAWG, Happy Fathers day to you too!!! Thanks G Todd for the kind words! That must have been quite a feelin’… Thanks for sharing… Happy Father’s Day to you, and to- ALL the REGULARS of this blog, (that are father’s), that may have spent any time reading some of my ‘novel’ length posts…. HAPPY FATHER’S DAY, to all of you. Thank you Jeff for taking the time to comment!! Too cool Jason. Cash’s smile says it all. What a well deserved culmination to a father son hunt. I love the picture of him glassing, that’s classic! Happy Father’s Day! Thanks Ryan for the comment. I hope you have a great weekend at Compton. It is rare & inspiring when father’s put family first. My hat is off to you. There is no greater reward for a father. Thank you Seth!!! Happy Fathers Day to you. What a great short story that will undoubtedly be a life long memory for you and Cash. 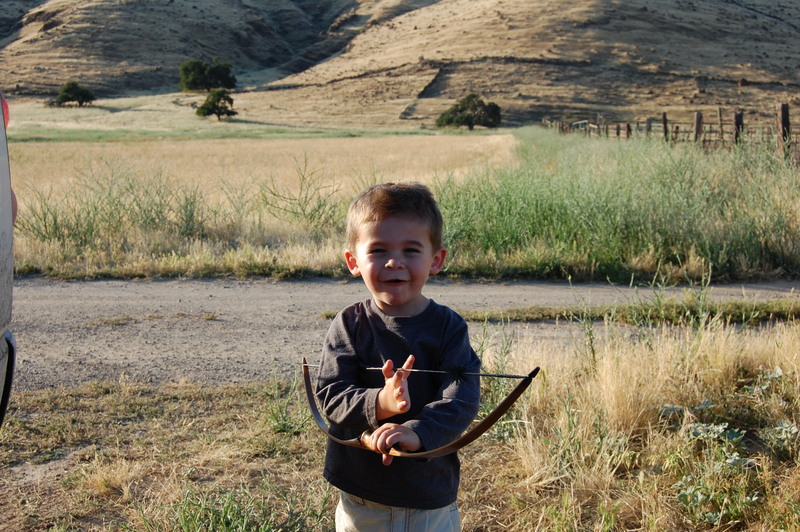 I can’t think of anything more gratifying than having our children along with us during our days bowhunting. BTW…my son’s name…..Cashton….what a coincidence.! Someday Cash and Cashton will have to hit the hills together! Thanks Corey! We need to get Cash & Cashton out in the field together for sure! It just does not get any better than that! No matter what kind of trophy you might take, you just experienced the high light. Nice job. OUT-standing Jason!!! My two are only 16 months and 2 weeks but you can bet that both boys will be at the ranch chasing whatever they can, just like I did growing up. It’s very unfortunate that more kids AND fathers aren’t able to share this kind of moment with each other. It is a tradition and skill set that has been handed down since we began to gather our own foods, and just because it isn’t a skill that is absolutely needed in these times, doesn’t make it any less important or powerful. Congratulations on the kill, but a more important thank you for keeping the flame burning and that Hemmingway, Capstick and Ruark so beautifully wrote of alive and well. The same to all the dads out there. Well Said Trevor! Thank you for taking the time to comment. 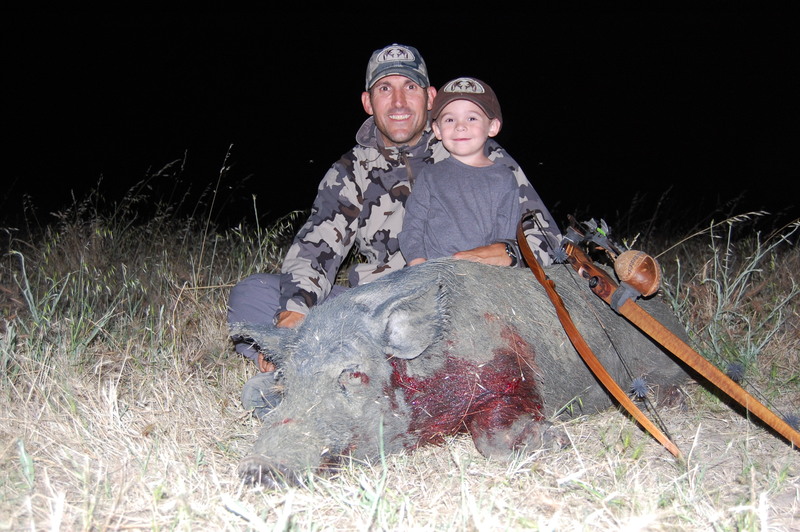 Jason, congrats on an awesome pig and even better hunt with your son with you!!! Memories for a lifetime…..
Congrats! Looks like another hunter in the making! Keep making those precious memories!